Japanese giants Sony and Panasonic could be on the verge of a joint televisual quest to bring down the cost of large OLED displays. Nikkei reports that an alliance is in the offing, which would see the two companies combine their respective knowledge and work together to commercialise the OLED tech. This could then lead to cheaper mass production of the highly-advanced super-slim televisions with the hope that those savings could be passed on to consumers. Both Samsung and LG are preparing for the imminent launch of the 55-inch sets they unveiled at CES 2012. Recent speculation says those sets may cost over £5,000 ($9,000). Both Sony and Panasonic are working on the means to match Sammy and LG, but could do with a partner to help shoulder some of the development costs. 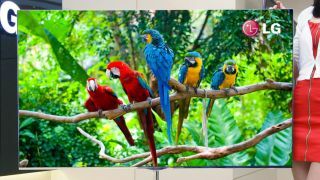 Sony is especially hard-up as its loss-making Bravia flatscreen division has been a major contributor to the slump that has seen the company post a huge operating deficit. Sony is, of course, no stranger to OLED tech having brought us the first glimpse of what it is capable of, with an 11-inch TV that wowed the world at CES 2008. With Samsung and LG now having a definite head-start with living room-sized offerings ready to leave the warehouse any day now, an alliance between their rivals seems a smart play.